We are mystified by many things these days. Today it is egg production. 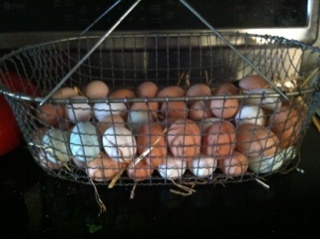 Last year in December we couldn't get the hens, even young pullers, to lay eggs. Now? Even the old nags and hags, separated out and placed in a pen for the oldest gals, are making whopping eggs. 66 in this basket alone. Tickled, we are.